With the gentrification of cities, the adaptive reuse of buildings has become a mainstream approach in the practice of architecture and interior design. Studio Ardete was commissioned to re-imagine the interior experience of a retail store located in the heart of the electrical and electronics market of Chandigarh. In the midst of the chaotic bustle of city life, the client not only wanted an interior overhaul and makeover; but was seeking a scheme that would set Disha Electrical and Lighting Store above the fray; and hopefully attracting a new breed of clientele. The design team interpreted the brief by setting out to create a high end electrical showroom experience; expanding it to encompass both decorative and outdoor lighting fixtures. For a store that sells electrical and lighting merchandise; it was clear from the onset that the lighting experience would need to showcase both the quality and variety of the various fixtures and components that the store had to offer. Having established the design approach, the defining decision that was made was to separate the store into two main zones. The front zone would be designed to display electrical equipment whilst the rear zone would present a studio-like space that showcases decorative and outdoor lighting fixtures. The two zones were linked together by a passage that acted as a buffer and transition route between the two regions of the store. Both zones were conceived as independent and individual entities that were governed by a mutual underlying design sensibility. On entering the store the visitor is greeted by a dynamic space that has a coherent theme. In a matter of speaking, the front zone is a study in contrasts with its grey background superimposed against the more fluid white forms that begin at the ceiling and drop down to form the walls. Whereas most retail stores present volumetric planes, here the spatial experience is layered. The white foreground pops out quite remarkably in regard to its black counterpoint. Close to the entrance, a semi-covered discussion area is clearly defined by white hollow pipes that extend from the floor to the ceiling. A circular patch of green felt on the floor and a mirrored receding circular ceiling serves to curve out a niche within the space for discussions with prospective clients. The white wall plane is punctured with circular display modules that in addition with other defined pockets of storage and display units break the monotony of the arbitrary shelf in stereotypical hardware stores. This approach precludes the possibility of conventionality without exceeding the boundaries of functionality and convenience. Further of, green felt is juxtaposed with the wooden paneling of display units of more electrical equipment. This design ploy, of having the front zone being composed of white and black; with a dash of green and wood serves to breathe life to what may have been a stark interior. The transition passage that links the two zones uses an infinity mirror to pique that curiosity of the visitor. The dark and sombre mood of the passage of course contrasts with the highlighted interior ambience of the front zone; and is also narrow to encourage movement and make entry to the rear zone more rewarding. The rear zone is carpeted from floor to ceiling with black. The centrepiece of the space is an irregular wooden volume that is designed to display fixtures within its pockets. This volume essentially makes the exhibition experience cyclic with the visitor moving round to appreciate the artefacts on display; with each fixture being given ample preeminence. The entire ceiling in the rear zone is covered with hanging fibre optic cables that lend the space with a feeling of surreal sophistication. Further ahead, the composition takes an outdoor setup complete with arched patio and porch. Here, outdoor light fixtures are displayed on the wooden porch and on the green ‘sidewalk’. The managing director’s cabin sits adjacent to the outdoor display area and is designed in shades of grey and brown. The ceiling is made up of receding wooden panels arranged in random to create geometrical patterns with its highlight being an iconic contemporary chandelier. The furniture here is dark to match the floor and the lower half of the wall; and thus, the upper half of the wall appears to be suspended. The store also has a meeting room that features a fabric covered walls and ceiling that have back-lit crystal lighting. A white section of the ceiling moves down and converts to a conference table which is the main focus of the space. 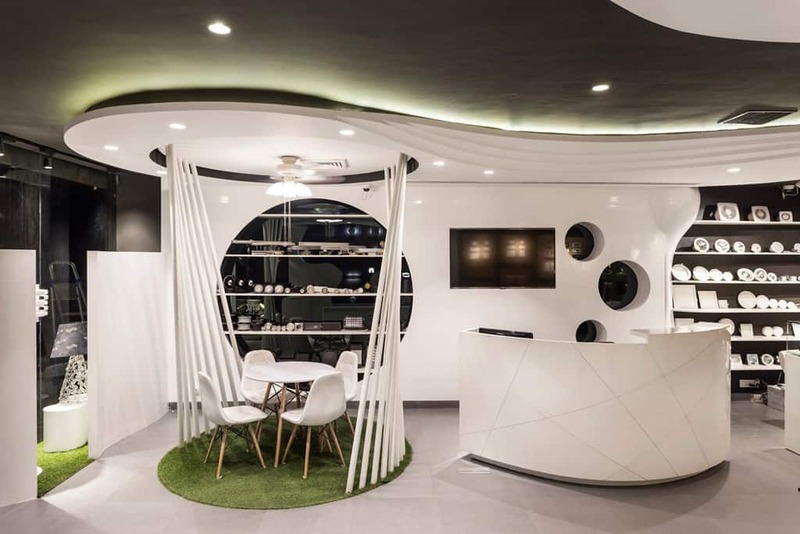 The Disha Electrical and Lighting Store is a noteworthy case study in retail interior design. Studio Ardete showcase a commendable design aptitude in the manipulation of volumes and materials to create a rather resolved interior. Needless to say, the visitor is transported from the street into a powerful interior that displays just how much the play of light and shadow can impact the way we approach both outdoor and indoor design.